So my doctor and I had a very detailed conversation about my health. He made some great points about things that I need to change about my diet. I thought that I was making healthier choices already but my current health situation beg to differ. I looked a my diet and made some much adjustments. Adjust number one has the family and I eating meat once a week. We usually have picnics on Friday nights and that usually involves me bacon, sausage, eggs, pancakes with a variety of fruit and hot chocolate. I decided to turn things around last night. I made an entirely meatless dinner and everyone loved it. I fried the sticks and used them in place of bacon and sausage and it was awesome. **the measurements might be off because I don’t always measure when I’m cooking but the pancakes came out fluffy and tasty even without me adding any sugar and eggs. This also came out really well, I even got the picky diva to eat almost all of her dinner. I didn’t add any sweetener to this smoothie because I didn’t think it was necessary. It was slightly tart but I like it. The diva and I battled over her drinking the smoothie but she did. I added green grapes to the mix and dinner was complete. Everyone had seconds, they ate the fried Tofu and never complained about it. I don’t think everyone knew that they were eating Tofu so I am just going to leave that alone. I will be looking for more meatless, egg-less, dairy-free and gluten free meal ideas. 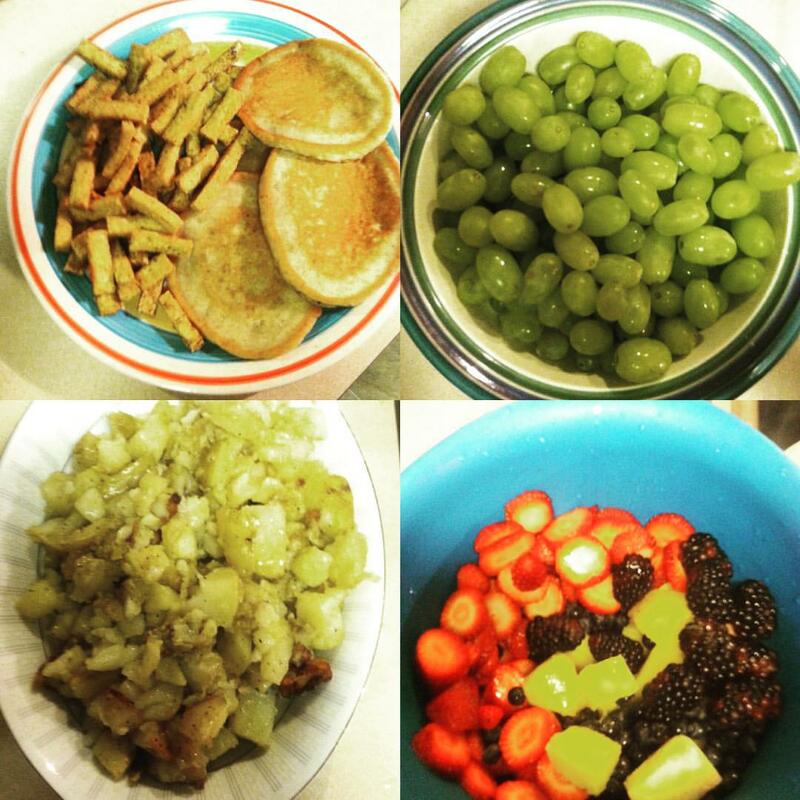 Posted in Health/Fitness, Parenting, Recipes and tagged almond milk, applesauce, bacon, banana, blakcberries, blueberries, dairy free, gluten free, grapes, Mango, meatless month, pancakes, pineapples, sausage, smoothie, strawberries, Tofu, vegan diet, Yukon potatoes. Bookmark the permalink. I had a rough weekend and that left me feeling kind of blah. I usually plan my meals in advance but I was just not into it on Sunday. I went to the Kingdom Hall and enjoyed a wonderful service. Afterwards a small group of us went out for lunch. It was nice being able to eat a meal without having to cut up someone’s food or ask for more napkins because someone spill their drink. I thoroughly enjoyed myself before saying thank you for the invite and saying goodbye. On the way home I kept thinking about the fact that my babies were coming back From their dad’s place and I had nothing planned for dinner. I walked in and looked around to find an idea for dinner s and then it hit me. 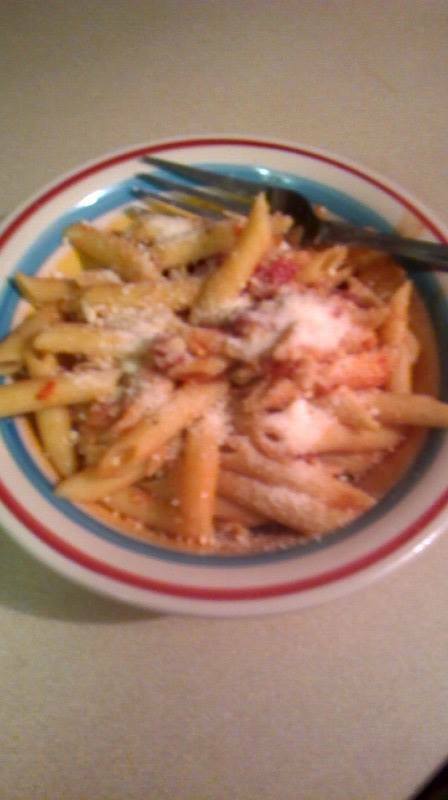 Penne with chicken and diced tomatoes. I had cooked some penne the night before and ate a small portion of it with chicken and pesto. I pulled 2 chicken breasts and cut them into bite size pieces and then placed them on a hot pot for about 10 minutes on low to medium heat. I used about 3 tablespoons of vegetable oil to cooked the chicken. I then add a can of Hunt’s diced tomatoes with sweet onion. I also add a pinch of salt and pepper to taste. I covered it up cooked the sauce for about 5 minutes before adding the cooked Penne. I let the sauce and pasta simmer on low for about 5 more minutes. I plated the food and then sprinkled some grated Parmesan cheese and then served it with some V8 strawberry/banana juice and the munchkins loved it… Correction, 2 out of my 3 munchkins loved it. In my book that was a successful dinner. When it comes to meal time, my goal is to make something yummy, simple and colorful. I have 3 picky eaters and it is rare for me to make a meal we all love. Here are the ingredients for those of you who want to try it out. Posted in Health/Fitness, Parenting, Recipes, Uncategorized and tagged chicken, Penne, quick dinner, sweet onion, tomatoes. Bookmark the permalink. I love to read and it has brought me tremendous joy. There is something about a good book that once it captures you, you can’t help but read it till the end. We all have a book or two like that we love to read several times a year. I have several books that I hold dear to my heart. One of them is ” Their Eyes Were Watching God” by Zora Neale Hurston. Another book that I love is the “The Gift” by Danielle Steel, I especially love “the gift” because it is set during one of my favorite decades. My passion for reading began back in Allentown, Sierra Leone. I remember sitting on my grandmother’s lap while she read to my brother, sister and I. This is a remarkable thing to me because my grandmother never went to school. She learned to read and write because of her husband and children. My grandmother (Mbalu Sankoh Bangura) fell in love with education and she made sure that shared her passion and thirst for learning with her grandchildren and I will forever be grateful for that. My grandmother passed away almost 25 years ago, it will be exactly 25 years on February 13th, 2015. She died due to complications from a brain tumor. I miss her more and more each year because she was such a beautiful person. I have been thinking about ways to honor her and so I decided to do something that will give back to the community. 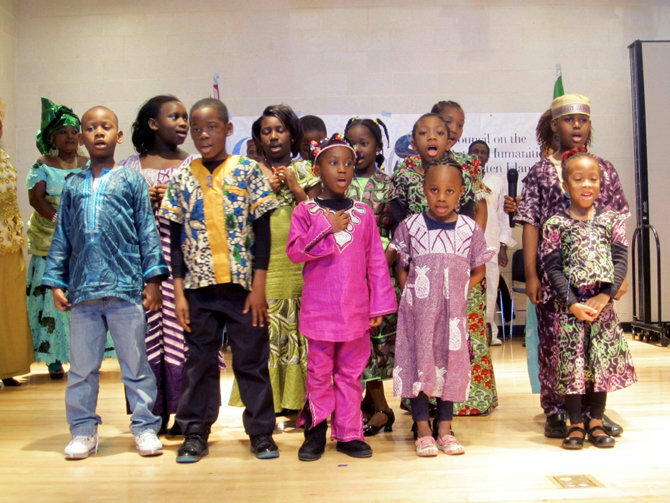 My grandmother was a giver and I am determined to build a library in Allentown, Sierra Leone in her honor. I want to inspire a generation of young girls to fall in love with learning. I fell in love with learning because my grandmother introduced me to books.It would mean the world to me if I can raise at least $10,000 to build a small library in her honor. My family has land and so I don’t have to worry about that part. Grandfather left most of his land to the family and so there is more than enough space for me to build this library. I have created a gofundme account to help raise funds. I will include the link for those of you who want to donate. My goal is to go back to Sierra Leone by end of 2015, that is if the Ebola virus has been properly contained. I am going to consult with a few of my friends who are contractor to help me come up with a simple design for the building itself. I am going to get my older brother to run the library since he and his family still live in Sierra Leone. I am also working on creating a foundation to help raise funds on a long-term basis. I would like to eventually build more libraries if it is financially possible. I thank you for your time and I wish you a blessed evening. Posted in Misc: Arts, Parenting, Starting Over and tagged Allentown, Danielle Steel, Ebola, Education, gofundme, Library, Love of Learning, Sierra Leone, Zora Neale Hurston. Bookmark the permalink. It is a new year and there are tons of opportunities for us to be better than last year. 2014 was a painful year in many ways. We saw the rise of police brutality in the States. We also saw the rise of several terrorist groups. We grieved with the hundreds of families who lost family members in several airplane disasters. I for one was highly disgusted by what I saw in the media and how morality seem to be on a decline. It would be wonderful if we as a society could take a step back and re-evaluate what are our morals are and how we want to be treated. We can’t expect to be treated with dignity if we don’t carry ourselves with dignity and respect. Respect is earned and it should not be demanded by anyone. Parents please take some time to educate your children about their true history…the one that is being excluded by the public school system. Parents please put your phones and other electronic devices and interact with your children. Our kids are much more fascinating than your phones and gadgets. Please teach your children that hard work is never a waste. We also need to teach that material possession cannot bring them happiness. Our children are the future and right now our future looks a little self-entitled and lazy. We need to work harder at being parents or we will regret the outcome. Here are a few things that I am personally going to work on this year. 2. Apologize less… I am a unique person and I should never ever have to apologize for being who I am. 3. Go out and enjoy the world around me…travelling overseas is one of my many travel goals. 4. Workout and do some races just for the fun of it. 5. Try not to worry about what I look like on the outside but rather focus on using my energy to make someone else’s life better. 6. Be the mother my children need and deserve. 7. Play more games, dance around and sing along with my kids and enjoy our time together. 8. Work on my relationship with God and share what I know with those who want to learn about him. 9. Forgive those who have caused me pain. 10. Write more and reconnect with old friends. These are some of the most important things that I am hoping to work on in 2015. Let us all make an effort at becoming a better version of ourselves and grow. I believe that we owe it to ourselves to take a moment to look at what we did well and what we could have done differently each year. Growth comes when we are willing to see our mistakes and make necessary changes. Well, I thank you for stopping by and I pray that you have a wonderful and blessed year. Posted in Parenting, Starting Over and tagged 2014, 2015, active parenting, children, family time, gadgets, New Year, the future. Bookmark the permalink. I put all the ingredients together in my crock pot and placed it in my fridge. I like to prepare my meals in advance to free up some time for homework with my kids. I pulled everything out and plugged up my slow cooker before we left for the day. It was really nice coming home and not having to cook. I didn’t take a picture of the final product but I will try to take one tomorrow when I eat some for lunch. Posted in Parenting, Recipes, Uncategorized and tagged basil, cauliflower, celery stalk, crock pot dinners, fall recipe ideas, Ham and potato, milk, soup, sour cream, stews, time saving meals. Bookmark the permalink. 1.Place meat in slow cooker. In a small bowl mix together the flour, salt, and pepper; pour over meat, and stir to coat meat with flour mixture. 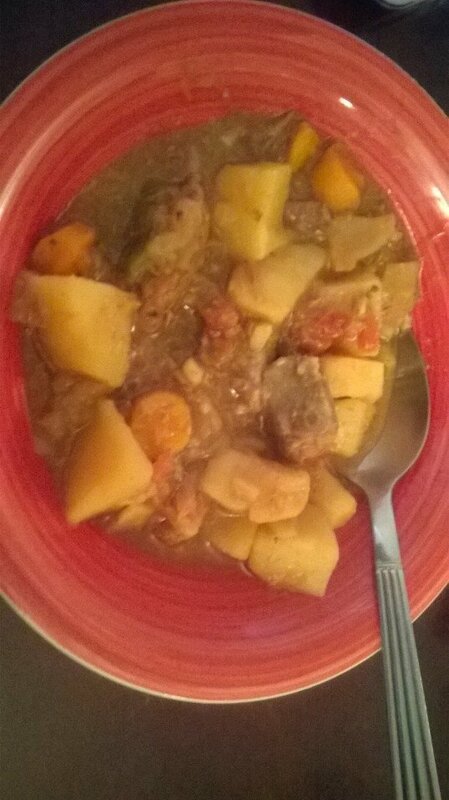 Stir in the garlic, bay leaf, paprika, Worcestershire sauce, onion, beef broth, potatoes, carrots, and celery. 2.Cover, and cook on Low setting for 10 to 12 hours, or on High setting for 4 to 6 hours. * I don’t always follow certain recipes because I like to be creative. This recipes calls for all-purpose flour but I used soy flour because I didn’t have any all-purpose flour. The original recipe said to use 1 bay leaf but I used parsley flakes. I like the creative aspect of cooking and it usually pays off. I am making this for dinner tomorrow night. I already did the prep work and all I have to do is plug up my slow cooker before we leave for the day and hopeful we will come home to a delicious beef stew. I also used a can of diced tomatoes and 1 tablespoon of ginger and that was not in the original recipe. I love ginger, I try to use it at least once a day in a meal, as cold or hot beverage. UPDATE: My food critics love it, it took some coaxing to get my 3 year old to try it. She is not a fan of potatoes so she initially refused to eat the stew since it has potatoes. She ate everything except the potatoes and I am perfectly alright with that. It was nice coming home this afternoon, the aroma of the stew caught the kids and I off guard. They all became excited about dinner the moment we got home. I didn’t have much of an appetite today, I can’t wait to have it for lunch tomorrow. It is my “me time” so I better get going. Posted in Health/Fitness, Parenting, Recipes and tagged beef stew, bouillon, celery stalk, crock pot cooking, fall recipe ideas, more family time, timesavers meals. Bookmark the permalink.